Barry Porter was – rightly – immensely proud of the birdlife on their Hella Hella farm on the Umkomaas River in KZN. We would sit on their stoep many weekend mornings over the years discussing the dawn chorus we had heard beofr erising which was ongoing as we drank our early morning chorus. Barry would tell us how, in all his travels, no place ever rivalled THIS dawn chorus; “His” dawn chorus. The Hella Hella Dawn Chorus. He did have a bit of an advantage, what with 5000 acres, different habitats, twenty years of indigenous planting and the the beautiful Krantzes, cliffs, grasslands and the Umkomaas valley! On a rare visit to the big smoke, he and Lyn stayed with us at 7 River Drive Westville and at breakfast he said in awe: This is the first place I’ve been where the dawn chorus rivals Hella Hella! I knew that, but I’d been diplomatic all those years! We recorded 121 bird species in River Drive, and found evidence of breeding in 20 of them – nests, eggs, chicks or fledglings. Our dawn chorus, too, was magnificent. Now, our new place, 10 Elston Place Westville was a horse of a completely different kettle of tea (and that phrase was a FreeState Reed-ism) when we got here seven years ago. There was one native strelitzia – the rest of the weeds were foreign nursery plants. The main trees were an avocado, a flamboyant, a loquat and a row of Aussie camelfoots. Aitch soon changed that and this morning I woke up to hear an AMAZING dawn chorus!! Shades of River Drive. Black-bellied starlings, dark-backed weavers, brown-hooded kingfisher (the Westville Kookaburra), olive sunbirds, bulbuls, white-eyes, touracos, white-eared barbets, drongos, prinias, both mannikins, puffback, boubou, francolin, ‘our’ robin, sombre and belly-aching greenbuls, GT woodpecker and all their cousins were singing, shouting and laughing at 10 Elston Place. That is awesome Pete! Summer is on the way and I will bet Aitch is part of that chorus!! Ibises, Mike, I’m guessing? Maybe not. Breeding well in Queensland. They have a strong presence at any sidewalk cafe anywhere in Brisbane. Especially where French fries are on the menu. Yep. I’m sure Mike was mentioning the dreaded Greater Westville Pterodactyl – the HaDeDa, Bostrychia hagedash. I always thought the species name was hadeda, but I looked it up now: hagedash! Dave Hill once rose from a hungover sleep and shot one on his Mid-Illovo farmhouse roof for playing the tenor clarinet with great volume and gusto without paying attention to the conductor. 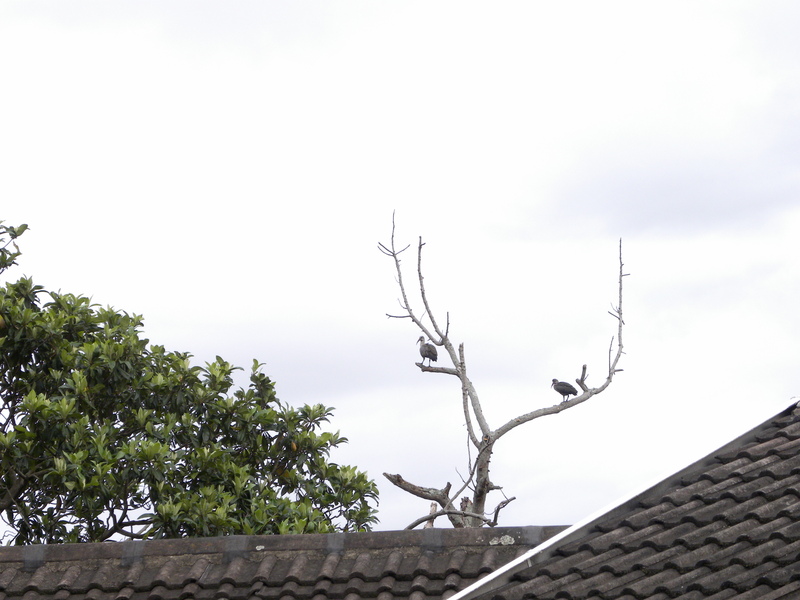 Here are two lurking Greater Westville Pterodactyls above our roof, perched on the dead avocado tree, waiting to let rip: Ha Ha Hadeda! Our Ridge garden over looking the Bay has old well established exotics. We never have less than 10 nests a year.